To-do filters let you turn off certain items, ensuring that what you view is a true representation of what you need to work on. Your To-do section brings together everything in Karbon that is your responsibility, including work items, emails, tasks and notes. To-do filters let you turn off certain items, ensuring that what you view is a true representation of what you need to work on. At the top of your list, you can choose to only view certain types of to-do items (work, email, notes, tasks), and/or items in chosen status/es. When you add filters, you'll notice that the numbers in your period tiles now indicate the number of items showing. You'll see a separate figure indicating the number of items in total. If you navigate away from your To-do list, any filters you have applied within the current session will be remembered. Follow up on items you've assigned your staff by navigating from your To-do list to a colleague's To-do list or items you've assigned. 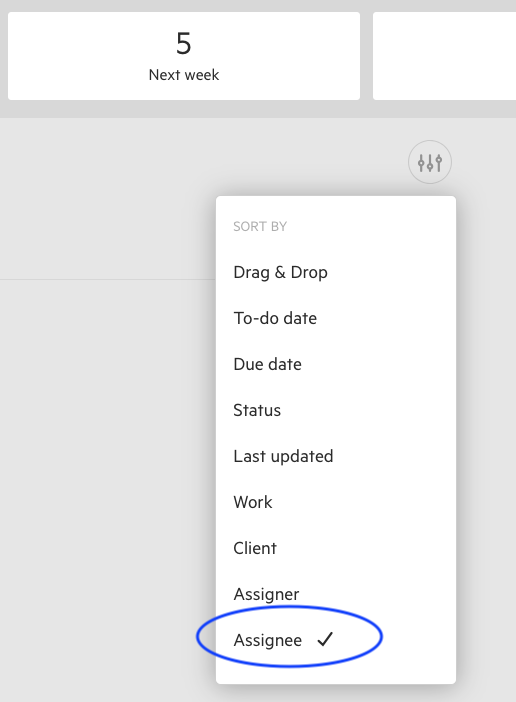 If you manage multiple team members, sort by assignee. Learn more about Sorting your To-do list.